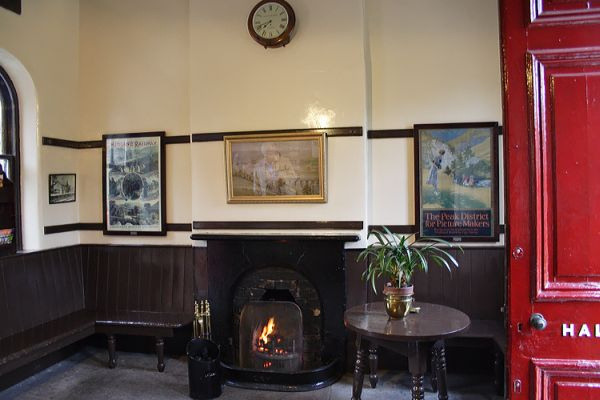 The LMS clearly did not see imposing a new corporate image in its stations as a priority, as until 1936 it continued to use the pre group colour schemes, gaining a reputation for shabby & run down looking stations in the process. In practice virtually no stations were repainted by the LMS before 1936, though now that the Furness & NSR came into the Western section they would have used LNWR colours if there was any repainting. 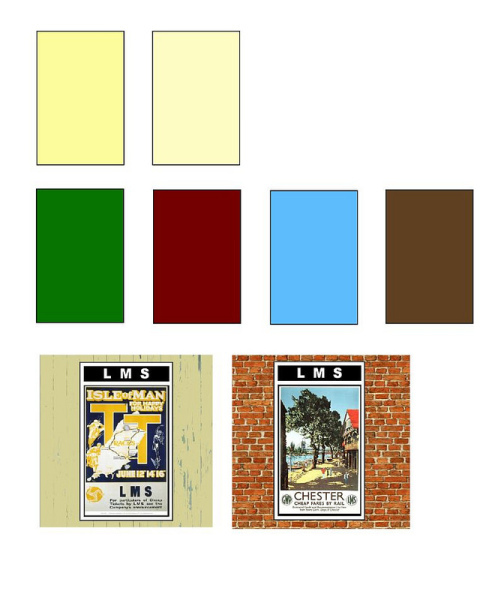 Even after the new standard schemes were introduced it took time before all the stations had been treated, so any modeller wanting to represent the LMS pre-war would be best advised to use the colour scheme of the appropriate pre-grouping company but with LMS poster boards. 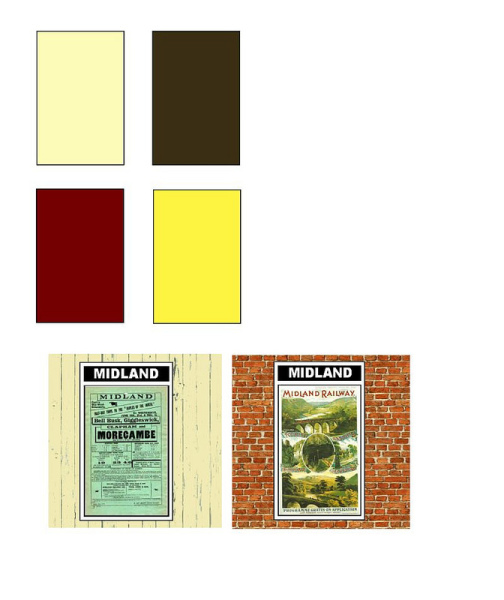 The company began thinking about a new livery for buildings in 1931, when standard colours of 'stone' and 'brown' were introduced for all signal boxes, the stone colour being used on planking and the brown everywhere else. However, the S&T department did not take over responsibility for painting signal boxes until 1933 so for two years things were a bit hit and miss. Internally the brown was used up to dado level and the stone above, the interior of the roof and the window frames being white. 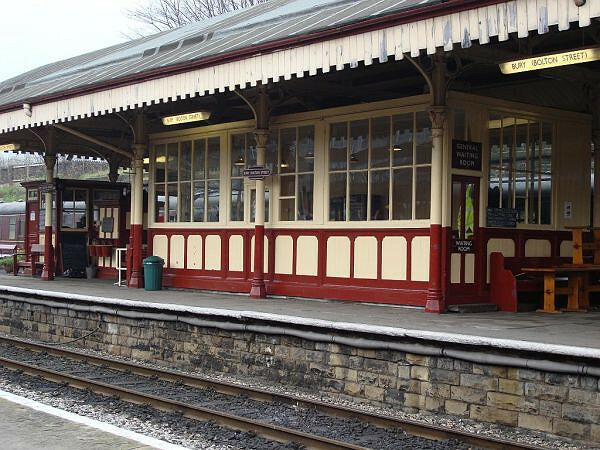 Despite this new standard scheme some boxes on the Central Wales line was painted cream & green to match the stations in 1937 - it was a long way from headquarters! 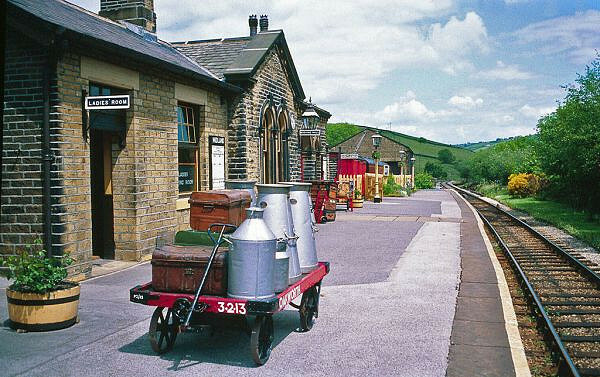 The photograph below of Embsay box shows this livery beautifully. The nameboard was yellow with black lettering. 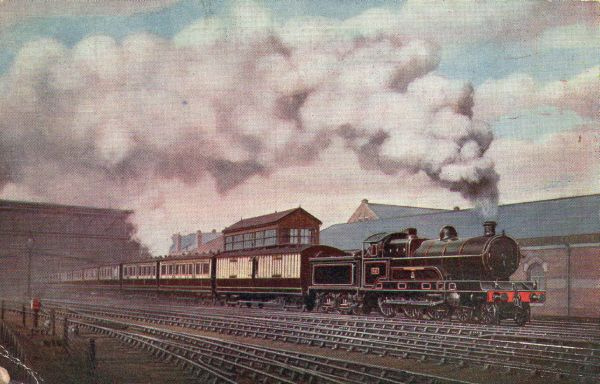 Stations did not receive a standard painting scheme until 1936, a full thirteen years after the LMS was formed. Two light colours were introduced, 'cream' and 'Portland Stone' which were to be used with one of three darker shades, 'brown', 'red' and 'green'. The red was a dark shade similar to Midland read as used on LMS loco's and coaches, and the brown was very similar to the former LNWR colour. 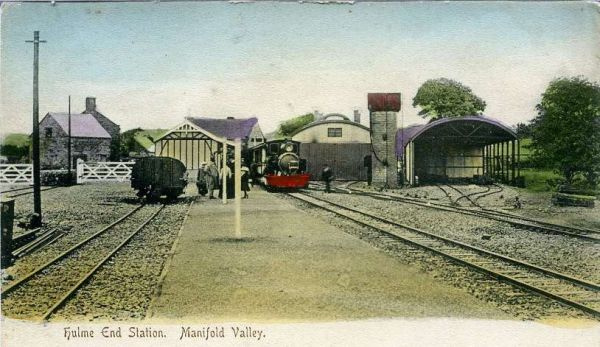 The majority of stations were repainted using the red or brown as the darker shade, with the green supposedly being reserved for bucolic stations in the middle of nowhere with the view that the buildings would blend in better with the rural landscape. 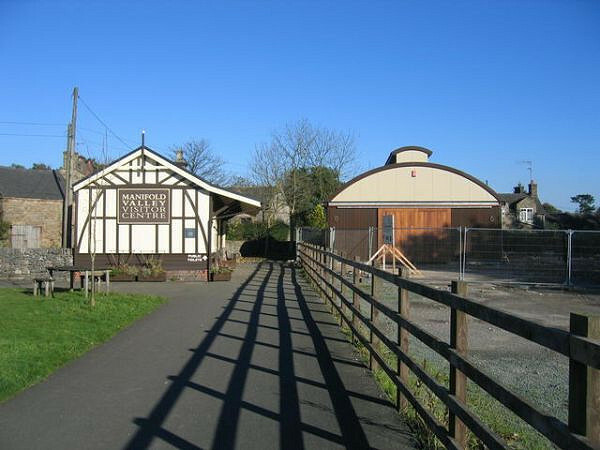 It was used on the Central Wales, and the Nailsworth branch which closed to passengers in 1947 and thus never received BR paintwork. I saw it there on the stations in the mid 1970's. However, all the stations on the Syston to Peterborough line seem to have been painted in green & stone and that certainly isn't a sleepy branch line, it's an important cross country route so the colour scheme may have been more widely used than had been thought. I have colour pictures of Wymondham, Whissendine, Manton, Luffenham, Ketton, Stamford & Helpston stations in green & stone so it is reasonable to assume the others carried that colour scheme too...what's more other than Melton Mowbray they were not repainted by BR, those that were still open carried LMS colours into the 1960's. To see the pictures go to www.systonandpeterborough.co.uk . 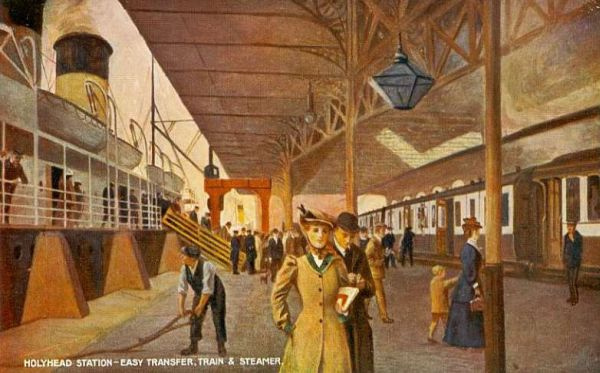 Poster boards on the LMS were always black with the framing and lettering in white; station signs were similarly painted. Running in boards were white on black until 1936, when black lettering on a yellow background was introduced along with the new 'target' nameboards. 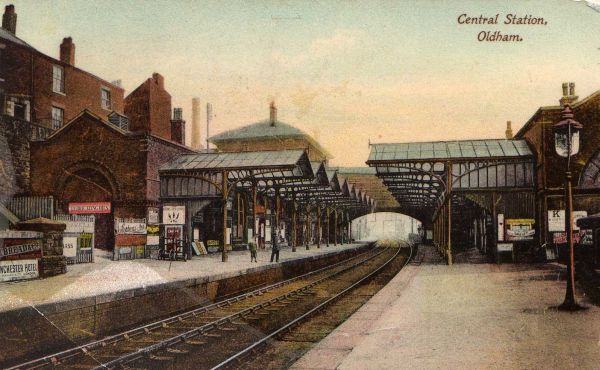 On electrified lines, a colour called 'Golden Brown' was used with cream or on its own as it resisted the dust from the catenary better than the standard colours. I would suggest in view of the above that the LMS used red, brown, green or sky blue to be used with either cream or stone as their standard colour scheme from 1936 onwards, and that the green & blue, while not as common as red or brown, were by no means unusual. The BS 381C references for the LMS colours are: Portland Stone 364, Cream 353, Brown 411, Red 445 and Green 226. PAINTS FOR MODELLERS: Portland Stone; I use Precision 'LMS cream' which is mislabelled and is actually the stone shade. For Cream I use Precision SR buildings cream. Precision do LMS buildings brown, or Tamiya Flat Brown is fine; for red Precision LMS coach red fits the bill. For the green shade I use Tamiya flat green. Humbrol 73 'Wine' is useful for faded red paint. 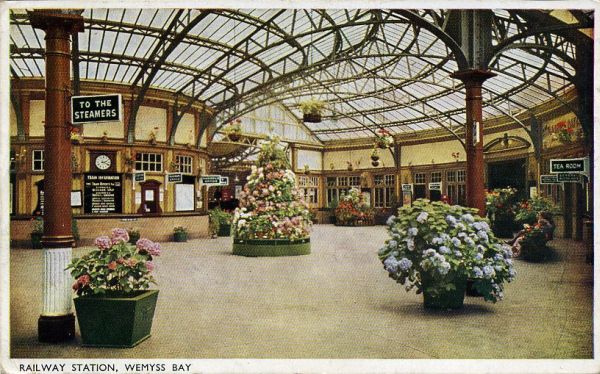 ​On the right is a coloured postcard of Weymss Bay station in LMS brown and cream colours. Below is a picture of Stamford, hardly a bucolic backwater, in the green and stone colours. 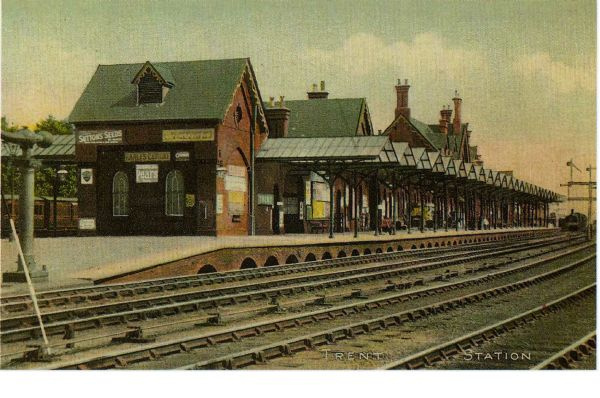 Most of the stations on the Syston to Peterborough line carried this scheme. It was quite faded by the time the picture was taken in the early 1960's...the station was never repainted in the BR regional colours. 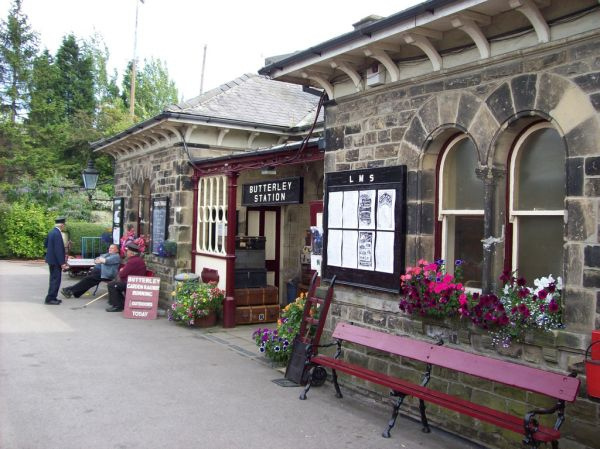 This is the image mose people have of an LMS station; dark red paintowrk with either cream or stone for the lighter shade, seen here at Butterley. It is very much only part of the story though. 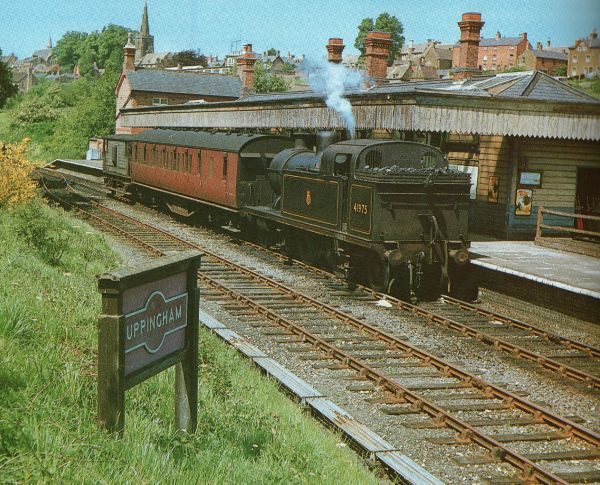 Below left is Uppingham station in LMS sky blue and stone, just before it was repainted by BR and then promptly closed. 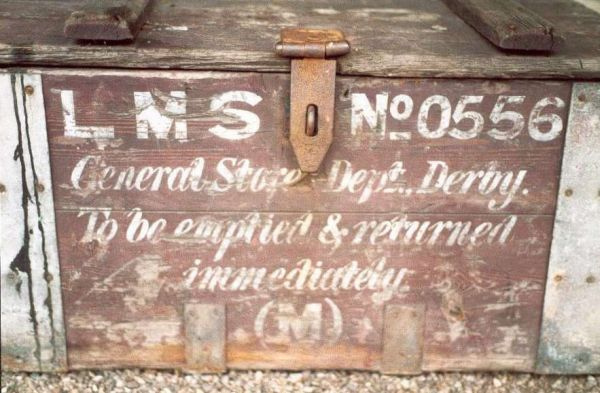 Below is a wooden box from a station on the North Staffs, still in LMS paintwork. Presumably at one time every station had one of these. When the LMS brought in standard colour schemes for buildings, signal boxes should all have carried this livery, though it was not always the case as the picture of Stamford shows. The colours are brown and stone, with the nameboard in black and yellow. 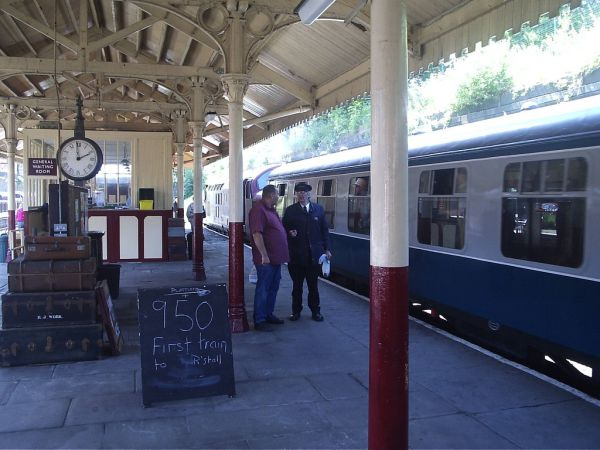 This is the restored box at Embsay station. The Midland used a very attractive livery for buildings, which was used on everything other than signal boxes. A very pale cream called 'Denby Pottery Cream' was used for planking, valencing, etc, with a reddish brown officially called 'Venetian Red' for ironwork, framing etc. Doors were painted in a deep red, almost certainly the same colour as was used on loco's and coaches. Window frames were painted white. 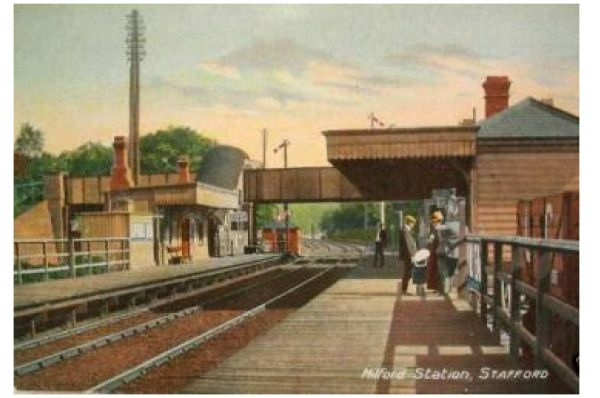 Poster boards were back with white framing & lettering, either 'MIDLAND' or 'MIDLAND RAILWAY'. Station signs & running in boards were deep blue with white lettering & framing. The well known diagonally planked wooden fencing was always creosoted, never painted so should be finished on models in black or very dark brown; gates however were cream. Lamposts and the like were finished in the cream & brown. 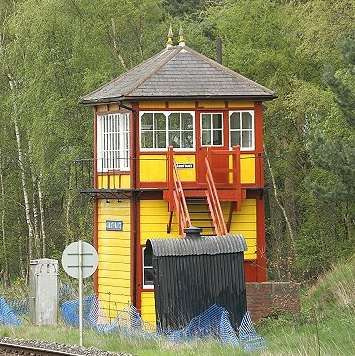 Signal boxes had a different colour scheme to make them stand out on the lineside; the planking was painted Lemon Chrome Yellow, as were signal posts, with the framing, stairs, guttering, finials etc. finished in the same Venetian Red as on the other buildings. Window frames and internal walls were white. The BS 381C references for these colours are 354 for the Yellow and 412 for Venetian Red. The yellow faded over time to a 'Cotswold Stone' buff shade. The nameboards was deep blue with white lettering & edging. PAINTS FOR MODELLERS. For the pale cream I use Tamiya flat white with a little yellow mixed in, and for Venetian Red I use Tamiya 'Red Brown'. The colour for the red doors is Precision MR loco or coach Crimson Lake, over a brown undercoat. For signal boxes, I use Tamiya flat yellow for a newly painted box, and Tamiya 'Flesh' for faded planking. For the blue used on signs & notices I use Tamiya Royal Blue. 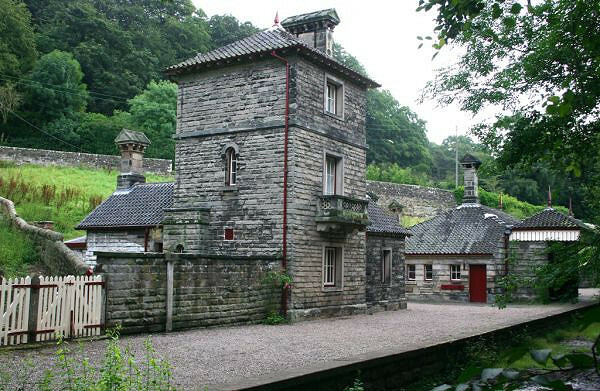 Midland Railway perfection on the Keighley & Worth Valley, inside and out. 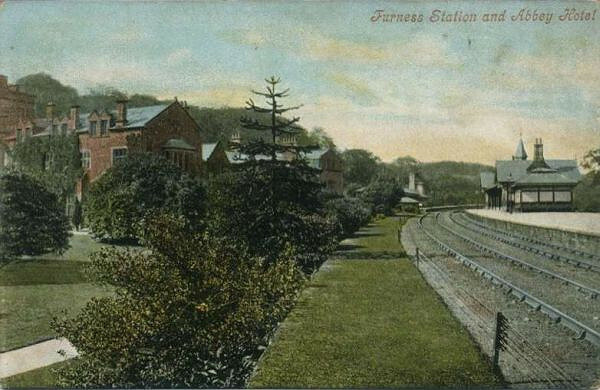 On the right is postcard of Gloucester station when it was newly built. 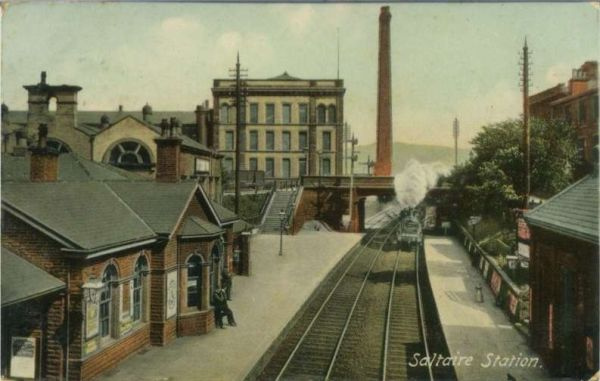 Below is a less colourful scene at Saltaire, and below right is a postcard of Trent station. Signal box livery on the Midland was very distinctive, and was designed to make the box as conspicuous as possible. The yellow did fade with time to a lighter Cotswold stone shade, but a newly painted box certainly stood out. The nameboard was blue with white lettering. The LNWR standardised it's colour scheme for buildings early on as it did pretty much everything, and it never changed thereafter. There is more than a suspicion that they simply picked the cheapest pigments and used those! Planking, valencing etc. was painted in one of two colours, 'stone or 'cream'...the former was a buff shade and was by far the most widely used. Used with these was a darker shade, either Light Brown or Dark Brown. Window frames were always white. These colours were used on all buildings, including signal boxes. Station poster boards were painted black with white framing, and an enamelled plate in dark blue with white lettering was screwed to the top spelling out the company name in full on two lines. 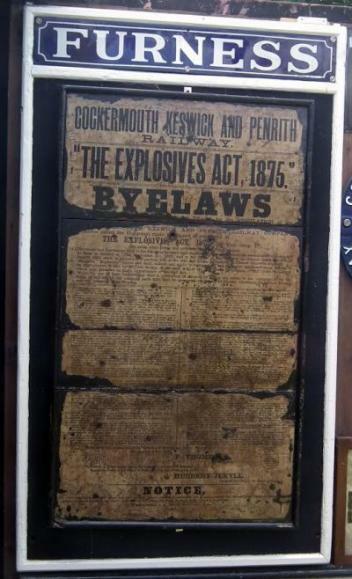 Station signs & notices were black with white lettering & framing, as were running in boards. BC 381C references for the coulours are: Stone 361, Cream 352, Light Brown 414 and Dark Brown 411. PAINTS FOR MODELLERS: I use Stone and Dark Brown for LNWR buildings as that seems to have been the commonest combination. I use Tamiya 'Flesh' for the stone/buff, with Tamiya 'Flat Brown' for the dark brown. For cream I would use Precision SR buildings cream, and for Light Brown Precision GWR dark stone. 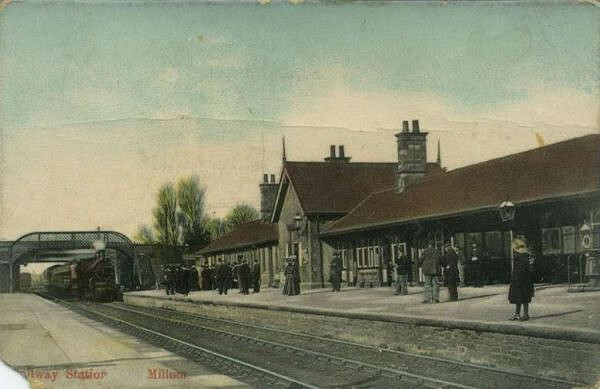 A coloured postcard of Milford station which illustrates LNWR building colours very nicely. 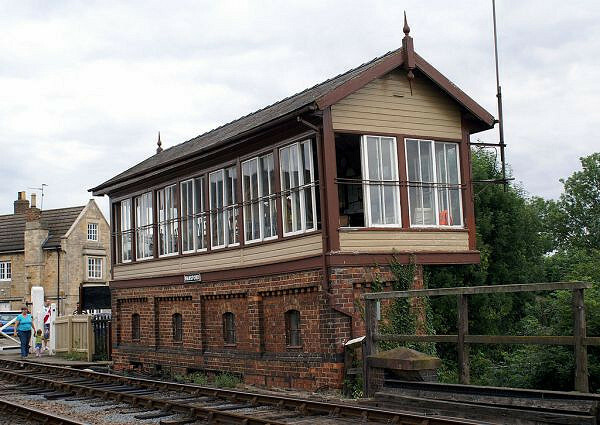 The LNWR used exactly the same colours on their signal boxes as on the stations, as seen here on the restored box at Wansford. 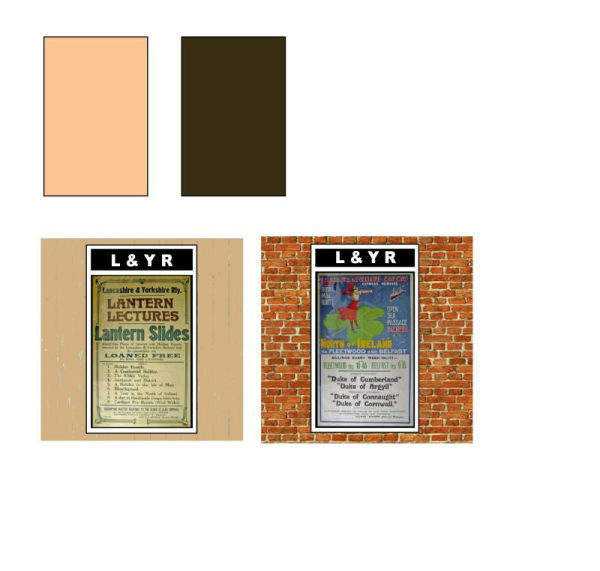 The L&YR official paint scheme has not survived, but it is known that a mid-brown was used for doors, ironwork, framing etc. together with a lighter shade called 'Tan' for planking. Window frames were white. There has been suggestion that canopy valencing was painted in alternate stripes of tan & white but I have seen only one photograph which may be evidence for this and it seems very unlikely; stripes of tan & brown however were commonly used before 1914. In later years valencing was all painted in tan. 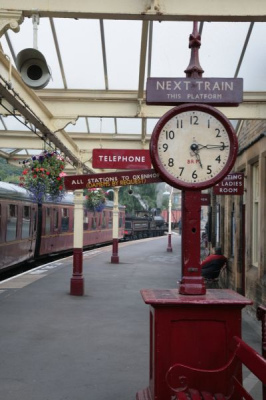 The photo referred to is of Denby Dale station (p52, 'West Yorkshire Railway Stations' Norman Ellis) and the striping does look very pale, but I think it was probably newly painted tan rather than white. Poster boards, running in boards and station signs were painted in black with white lettering & framing. 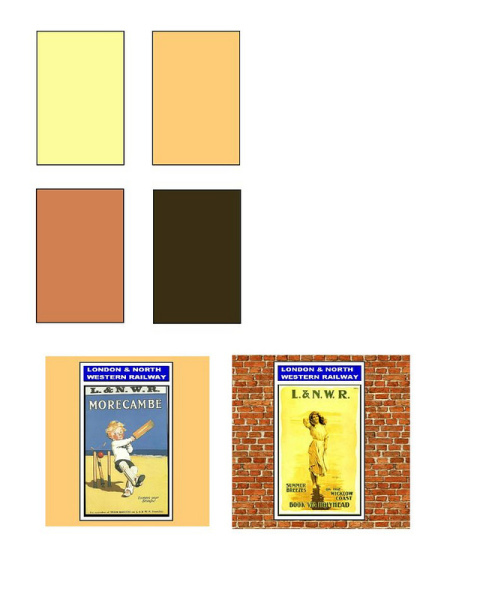 PAINTS FOR MODELLERS; To paint an L&Y station I would use Tamiya 'Deck Tan' with Tamiya Flat Brown. 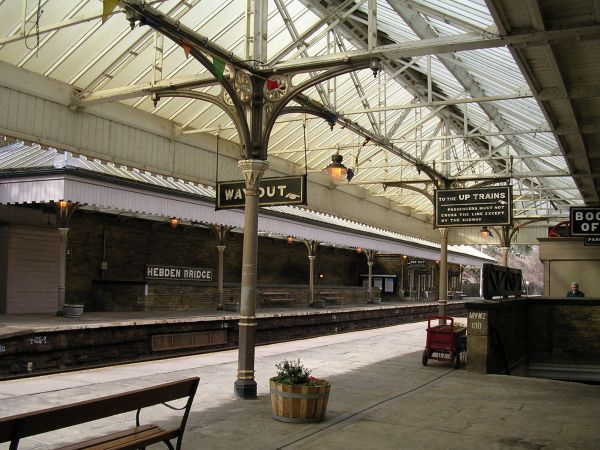 Remarkably the LYR signs at Hebden Bridge station have survived, giving a taste of what an L&Y styation looked like. 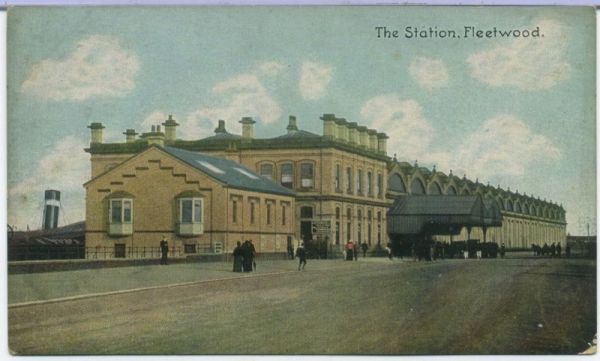 Below is a selection of coloured postcards of L&Y stations. 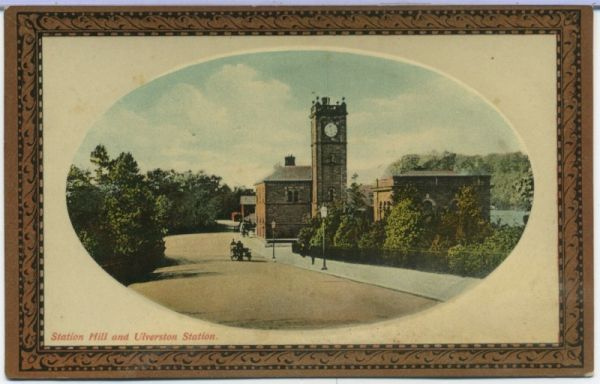 The company was well served by the postcard publishers. The Cheshire Lines Committee was a joint line that retained it's independednt joint status until 1948. It was formed originally by the MLSR and the GNR but the Midland became a partner resulting in the joint status after 1923. 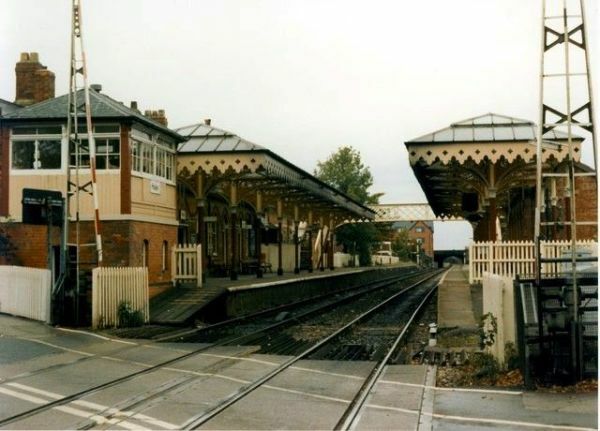 Although the former CLC lines became part of the LMR of British Railways it was not until 1951 that the responsibility for the painting of the structures was absorbed into the larger region. The information in this section has kindly been provided by Peter Scott. 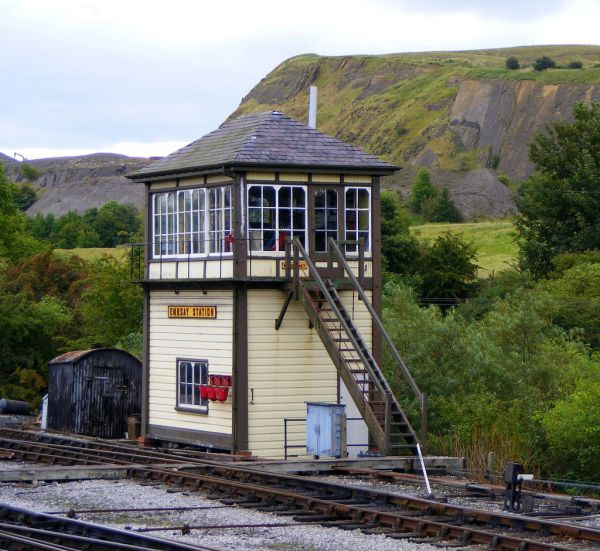 The CLC had their own colour scheme of light stone (similar to the GWR colour) and a mid brown which was used on all structures inclding signal boxes. 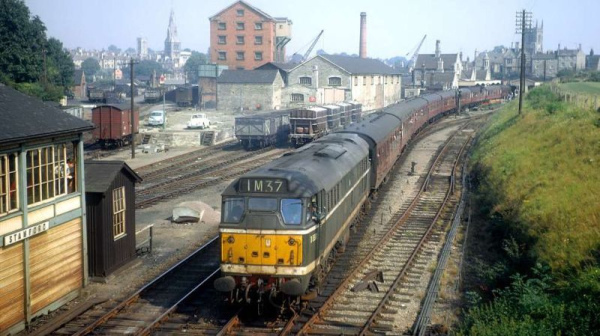 The livery continued to be used through the LMS period and until 1951 under BR. The BSC numbers of the colours are Light Buff 358 and Mid brown 411. 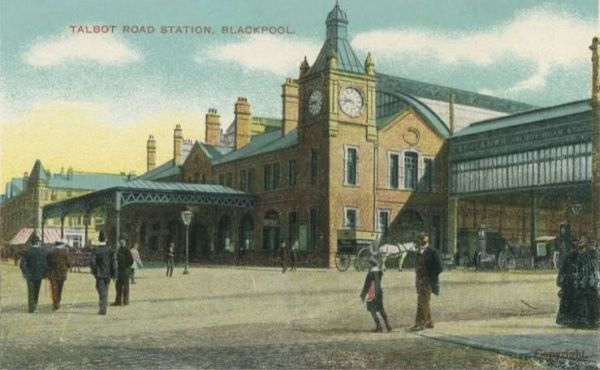 The look of the buildings was similar to the L&Y, but the CLC also used the same colours on station nameboards and signal box nameboards; all other signs and notices were white on black. 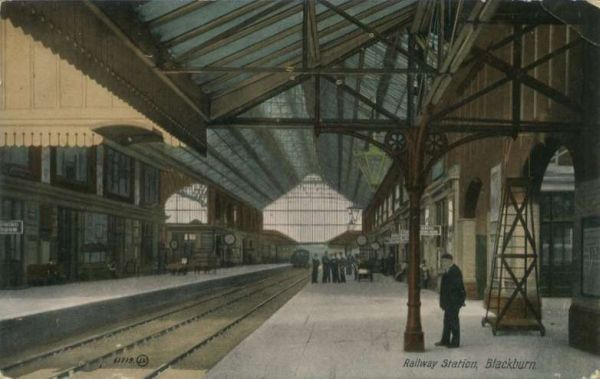 Station awnings often had the valencing painted in stripes of alternate colours. Some station nameboards were replaced using concrete, in which case the lettering was painted black. Hale station in CLC colours. Photo courtesy of Peter Scott. It has not been possible to trace any official documentation on the Furness, but what follows is what I believe is correct. A light cream similar to the Midland shade was used on planking, set off with an attractive red shade called 'Madder Lake'. This was a translucent pigment so a red oxide undercoat was used which gave a rich red colour with a brownish tint to the top coat. The Madder Lake was used on ironwork, doors, framing etc. while window frames were either cream or white. 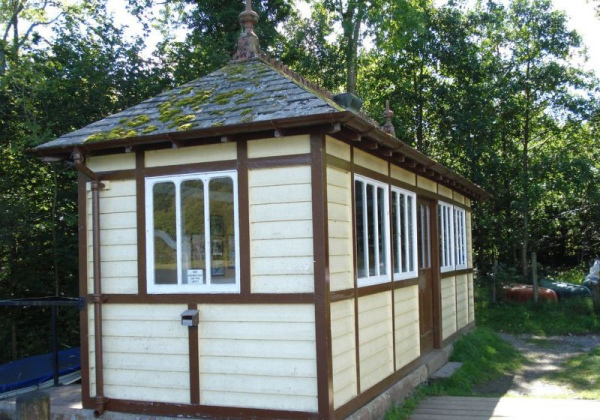 However, the restored waiting room in the photo below, now in use as a boating club shelter on Coniston Water, was restored after the original paint had been revealed and the oldest layers were cream and brown which may indicate that these were the colours used by the FR. However it may also be LMS colours, the underlying paint having been removed when the shelter was repainted - it's impossible to be sure. 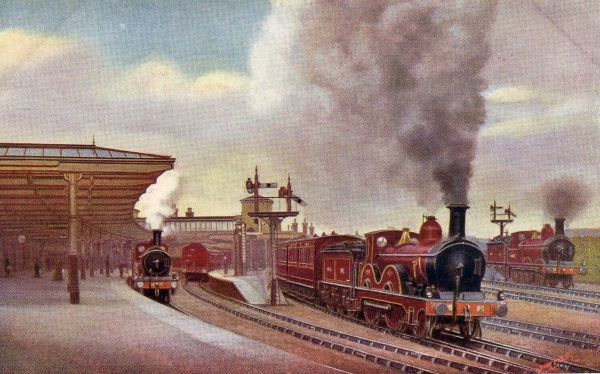 A painting by K. Welch on the rear cover of 'The Coniston Railway' (Cumbrian Railways Assocation), shows the station in buff & brown but I have no idea if the artist had access to official information or indeed when the picture was painted. The Furness is probably the most frustrating company to try to pin down; it's just not possible to arrive at definitive livery. PAINTS FOR MODELLERS; To paint a Furness building I would use cream mixed from Tamiya flat white with a touch of yellow, and Precision MR Crimson Lake over an undercoat of Tamiya Red Brown. 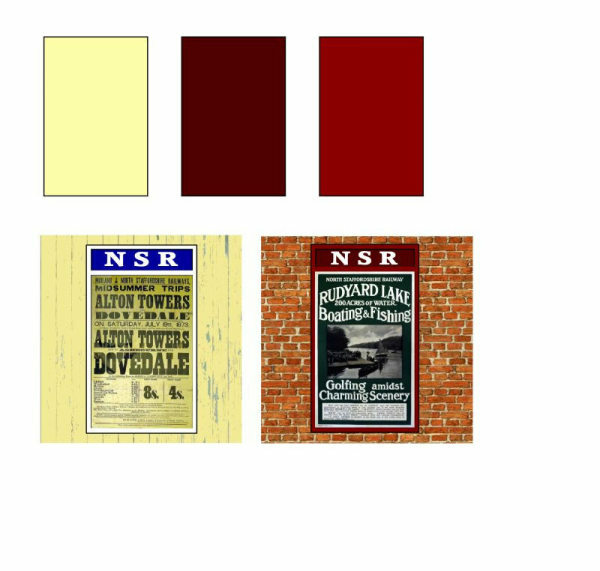 Up to around 1900, the NSR used a livery of cream & brown on buildings with the cream being used on planking etc. in the usual way. Valencing was often painted in alternate strips of the two colours. 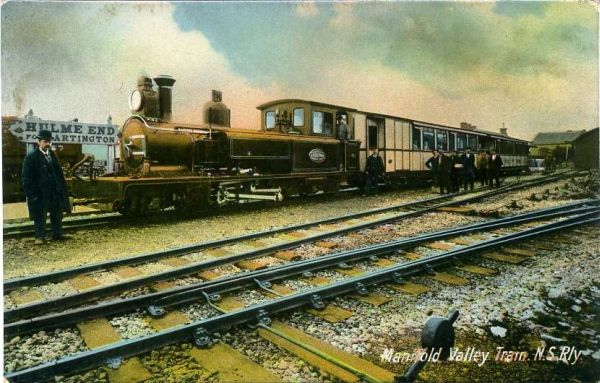 The brown may well have been the same colour as the 'Victoria Lake' used on loco's & coaches from the late 1880's in which case it was a purple-brown colour. Around 1900 the darker colour was chaged to Indian Red, a similar pigment to the FR colour despite the different name, which was used with the cream as before though some larger buildings away from the public areas were painted in Indian Red all over.....this should be obvious from a B&W photograph. The Indian Red was used over an undercoat of blue/grey which gave it a dark finish in contrast to the similar top colour being used on the Furness. Window frames were white or cream, and when painted window cills were buff, presumably to make them look like stone. 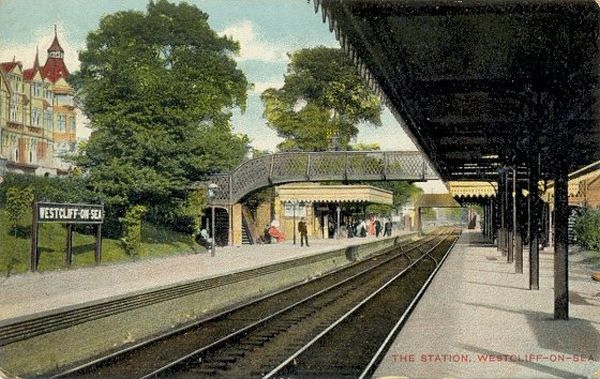 Station running in boards were blue with white lettering & edging, and fencing was white with black ironwork on gates. Poster boards may have been brown, Indian Red or black, with a blue enamelled plate on top with 'NSR' in white lettering. PAINTS FOR MODELLERS: For the pre 1900 colours I would use Precision SR buildings cream with the purple brown mixed from Tamiya flat brown and a little blue. For the Indian Red I would use Precision MR Crimson Lake over a grey undercoat. 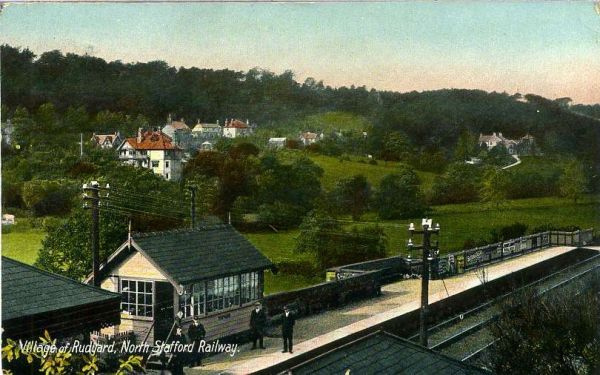 Postcards of NSR stations are extremely hard to find; all I have is this one of Rudyard Lake. 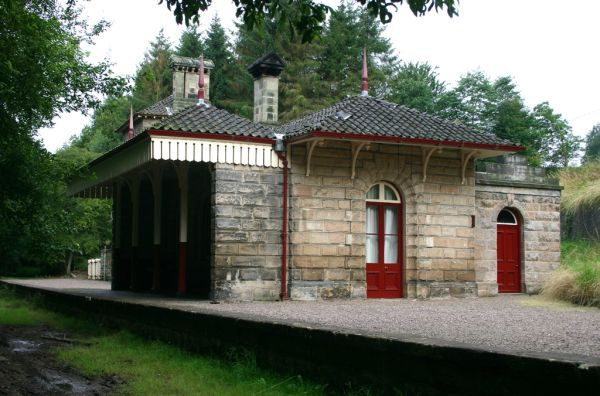 Below it are two pictures of the restored station at Alton Towers. Although independent from the NSR it makes sense to deal with the Leek & Manifold here. The buildings were finished in a light colour which was probably the Primrose Yellow used on the coaches, with brown framing, doors, etc. The preserved Hulme End station, however, is finished in a lighter cream which may well be correct. The water tank in the postcard of Hulme End below is red oxide which may give an indication of the colour used on bridge girders, etc. The station nameboard is white with black lettering. The corrugated iron roofs are grey. All that I know is that buildings were painted in 'pale yellow' which was presumably set off with a darker shade, brown or dark red. 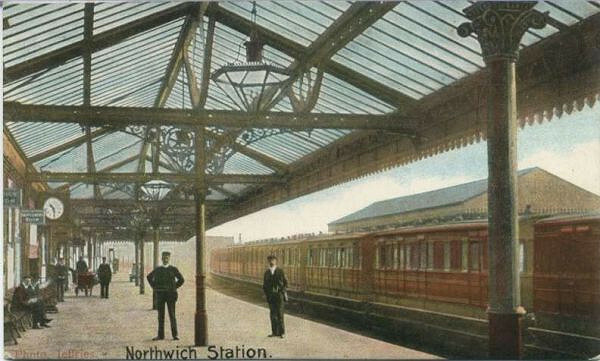 The bulk of the woodwork on LTSR stations was a creamy buff, with ironwork, doors etc. in a mid green. Footbridges were painted grey as were other metal bridges. Station signs were green with white or cream lettering & edging and presumably poster boards also used these colours. 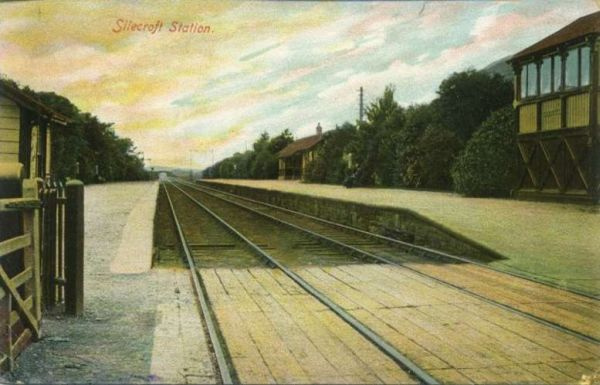 The postcard below suggests that running in boards were black & white. After the MR takeover of the LT&S presumably stations were repainted in MR colours. PAINTS FOR MODELLERS: I would use Tamiya 'Flesh' for the buff with Tamiya 'Flat Green' for the green. BRITISH RAILWAYS LONDON MIDLAND REGION. The BR colour scheme reflected the most widely used LMS colours, red and cream. The cream was the standard BR shade used on all regions (except the North Eastern), and the red was a dark shade similar to the LMS colour. Cream was used on planking and canopy valencing, with the red on ironwork, framing, doors etc. as usual. The official BR specification from 1960 gives the colours as BS 381C 'Gulf Red' and 'Light Biscuit' in which case the red is brighter than the LMS shade. The paints dried very matt, though, which lessened the impact of this attractive livery. 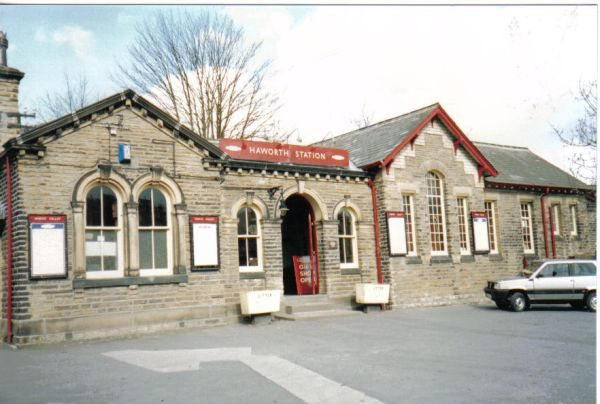 Poster boards & station signs were red with white lettering, including enamelled station signs on which the red was a darker shade. PAINTS FOR MODELLERS. I use Precision SR buildings cream with Precision BR coach maroon, or for faded red paint Humbrol 73 'Wine'. LONDON, MIDLAND & SCOTTISH RAILWAY & CONSTITUENTS.